Oracle ADF 11g Developer Guide is primary source of information for every Oracle Fusion 11g developer. 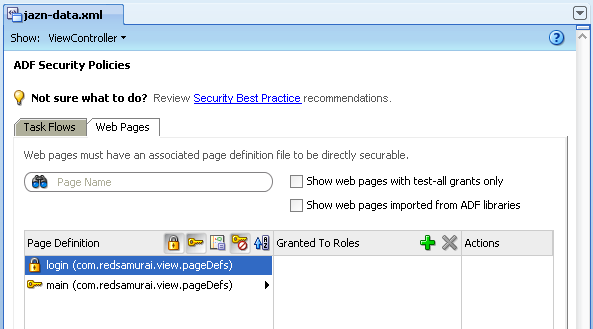 About security implementation, you can read from chapter 30.7 Creating a Login Page. What is the difference between smart and regular developer? 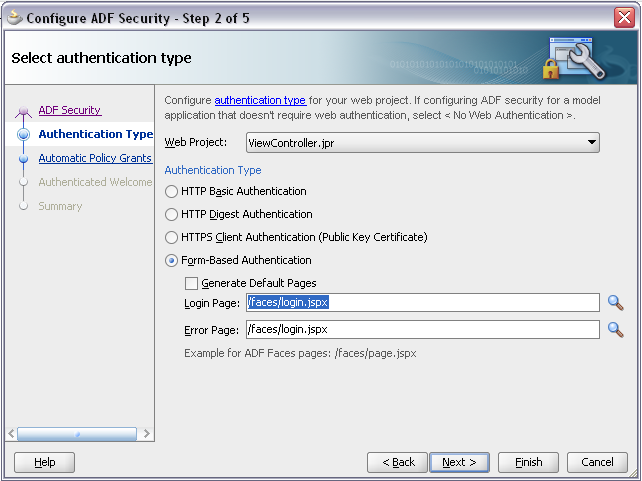 Smart developer is proactive and always knows more than it is described in developer guide :) I will present today few aspects of ADF Login Page implementation you should keep in mind, when working with ADF Security. At the same time this page is defined as login page - framework is trying to load it, but fails because no permission defined. Its why application simply hangs. at first very nice blog! But "JDeveloper 11g PS3 beta release" exists a public download-source for the beta release or is this "private"? first excellent blog :) i'm looking at your code for Login class and i'm wondering is it possible to call my own authentication servlet and not adf security servlet..i have a little project where i must use sso for authentication..i can use SSO.isAuthenticated(req, resp) to check if user is valid..and also i have a logout servlet which just sets logout url and it invalidates session..user informations are stored in database and i can't add them on wls (about 10 000 users)..i found some documentation about custom security but it worked only with 0c4j/jazn..can You give me any directions??? Its not calling ADF authentication servlet, its doing pure WebLogic authentication (weblogic.security). In your case, probably you could define your own security provider in WebLogic and use it for authentication. 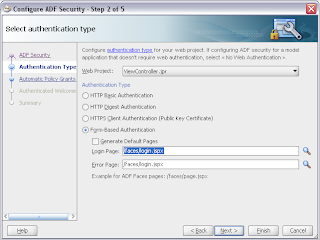 ADF application completely relies on WebLogic in this case, there is no ADF specific. And i found you post. I configured everything same as your step. But I can't see pages as anonymous-role. I created index.jspx with anonymous-role and run page. But it goes to login.jspx. It will redirect to Login page only from pages set with authenticated permission. Most probably you are trying to access page with authenticated permission. How to set page with not authenticated? Is it anonymous-role? Because i'm new of ADF Security. Yes, just assign anonymous role. It must work. I assigned anonymous-role, But not working. Same result. I attached my configurations, I think something wrong or corrupted. Maybe my anonymous provider not working. Also I deleted cwallet, jazn-data, jps-config, weblogic, weblogic-application. And When i again enable security, i get same result. But when i'm creating new application, it is working. This can happen only if jps-config file is corrupted, you can copy most of the contents for that file from another working application and it should work fine. Are any anything for check? (Files). Is it possible to send you my application (ViewController)? If possible, please send me your mail. Because this security issue very urgent for me. You should compare two applications, you have one working? I've succesfully implemented your login page and it's working fine, except one problem. If enter wrong credentials and hit login you'll get error message abot wrong un/pw, but if you hit button again without entering new credentials you'll get null pointer exception.I'm using Jdev 11.1.2. Or you can set both username and password fields to be required - this will prevent login attempt with empty password. I tried to deploy your application to weblogic after migrating it to release 2, then deploy to managed weblogic but it kept stuck on a loop trying to resolve login page. I also developed a sample application from scratch on release 2 and enabled adf security with same error. Can you send me migrated source code you was trying to deploy? I never received sample app from reader. When loop happens, make sure to remove anonymous autogenerated role from jazn-data. 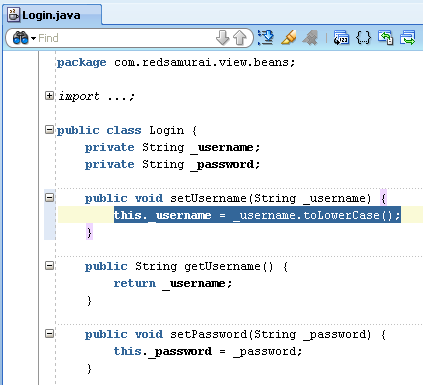 Restart JDev and assign anonymous role manually to the Login page def. Thanks Andrejus, this tutorial will help me a lot. "When loop happens, make sure to remove anonymous autogenerated role from jazn-data. Restart JDev and assign anonymous role manually to the Login page def." Hello Andrejus, your post is reaaly helpfull; i just have a question about dispatcher redirection; When i submit my authentification form , i want to stay on the same page without reloading it. at same time display the authenticated username. Yes, may be you can redirect to the same Login page. I'm facing with image rendering problem when try to customize login.html page. 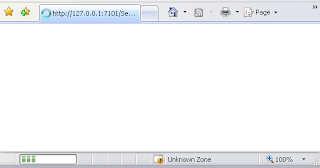 Tried to assign anonymous role to it but can't see it in jazn-data.xml. Any suggestion? it's not the same when i use Glassfish. I followed your application for login page. actually I migrated my project developed in JDeveloper11.1.1.2 to JDeveloper11.1.2.0 . login page is displaying but I am entering username and password . it failed with the error incorrect username or password . and in console I got the following exception :javax.security.auth.login.FailedLoginException: [Security:090304]Authentication Failed: User SYS javax.security.auth.login.FailedLoginException: [Security:090302]Authentication Failed: User SYS denied. so please tell me where I did wrong thing. need to some settings in realm?? You should define your user in jazn-data.xml and test it. 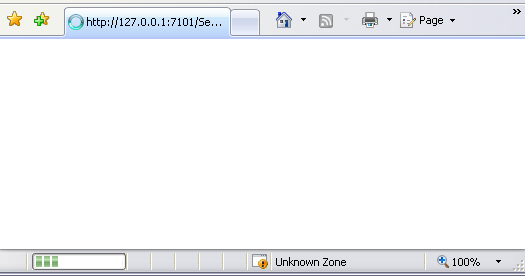 User SYS is not available by default in ADF. while am trying to configuring the formbased authentication in webcenter portal application,it is taking defualtAuthentication.I have given grant to some page but while loging it is taking default authenticated password.what i need to do.please suggest me? 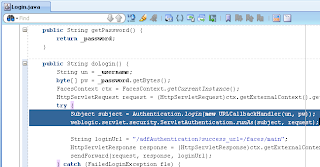 How can I manage weblogic integrated security in my application? i.e. 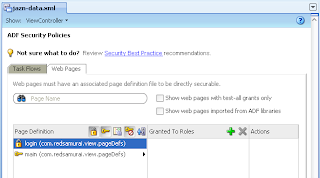 change password, create new user, assign roles, define new roles, assign resources to roles etc. You can do this with OPSS API. If both apps are deployed on the same managed server, i think it should happen. I'm trying to implement a logout function in my application. I'm using an af: button that references a managed bean, but when the application is running on the server returns a message that my MB is null. The application is the PageTemplate type, have some guidance on how to proceed? What is the difference between smart and regular developer? Smart developer is proactive and always knows more than it is described in developer guide. I have used bookmark / deep link in my application.. while accessing bookmark page if it's not already logged in then it will bring login page but after login it does not forward to bookmark page instead it forwards to default page... please give hint how can I fix this..? I am new in ADF. I have work on login and logout pages. when my app run first run from jdevelper 12c it ask me for login and after successful login it open all authenticated pages. but after logout and login again on same user or different user it fail to open any page. no error in log. please help me to sort out this issue.